Fun Fact: Even though she’s 5’11, she wears heels everyday. Writing the story of Baltimore. “I call Baltimore home,” says Claudia Jolin, Director of Economic Development for the Downtown Partnership. 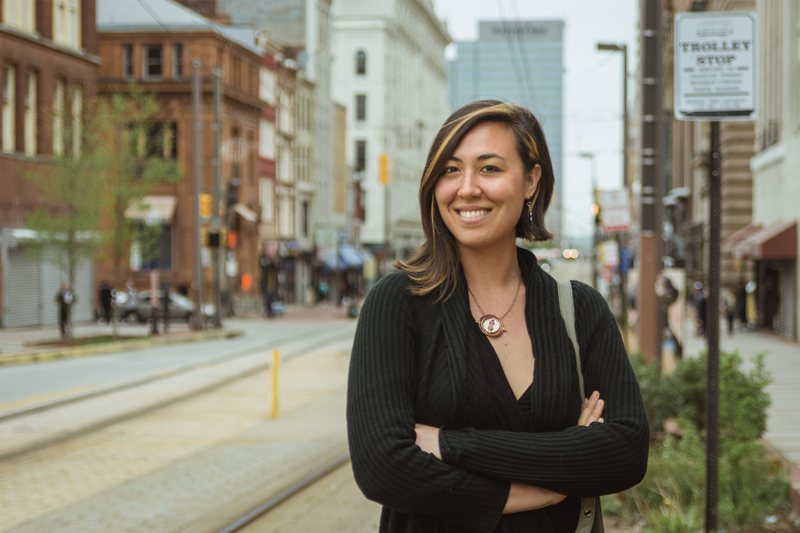 Jolin was in the military and lived in many places but Baltimore is where she lived the most. Maybe it was because her father lived here or she simply fell in love with the charming city, but Jolin has settled in the Better Waverly community. It’s there that she’s raising her almost five-year-old daughter. Now Jolin has directed her attention to the Bromo Arts District. The area encompasses three north/south corridors. The Hippodrome theatre borders the south and the north is marked by the historic Eubie Blake Center on Howard Street. The goal is to create a pedestrian friendly street that’s art heavy. In Jolin’s vision, a person should be able to walk from a local business to a secondhand store to an art venue all on the same block. This year the Charm City Fringe Festival is moving from Station North to the Bromo Arts District, but the Howard Street corridor has a lot of blight and vacant buildings. While there is great transportation in the area, there are no amenities to support the growing district. The area has been historically ignored by the city. “Vacancy in our city just perpetuates really poor management,” explained Jolin. She believes that if you pour more attention into the corridor it will attract more attendees and visitors. That’s why she is organizing a Star Walk demonstration during the festival to help visitors navigate through the corridor. Similar to the Star Walk in St. Louis, Missouri, there will be twenty to thirty semi-permanent stickers displaying stars from Baltimore on the concrete. These stars will serve as landmarks to show attendees that they are in the right district and in the right place.